This episode includes the unexpected for a podcast on money matters…..an ab workout. The workout? A good bit of laughter. Kelly Christian brings humor, personality and a great money story! Plus, she shares with us her thoughts on what she feels money really buys. Her Money Matters because it gives you time to be with the people you love w/@KellyChris25. In this podcast episode we discuss the importance of being surrounded by like-minded people. Is this something you struggle with or do you feel you have this under control? Be sure to share with us in the comments below! [0:00:26.0] JH: Hey, hey, it is so nice to have you tuning in today, this is Jen Hemphill your host and I’ve got another great guest lined up for you today. There is definitely a lot of laughs in this one just thinking about our conversation is making me want to laugh right now but I don’t want to give away too much nor be laughing alone because that’s just never fun. 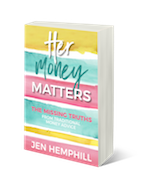 I did want to remind you about the dollar trial that you have waiting for you to our Fearless Money Sisterhood program and you can find that at Jenhemphill.com/podcastdollartrial. Be sure to stay through the end of the show because I tie in, it’s a very important message that I tie in what our guest, what she has done for her business, how it’s allowed her business to grow and why it relates to our Fearless Money Sisterhood membership program. In today’s episode, she’s going to give us the scoop on what the Ho'oponopono meditation is and how it has helped her with her mind. That is an interesting story. She also shares with us why she listens to Dave Ramsey almost religiously. That’s also super interesting as well and she shares why you would think I would mention this. Why the Roomba, what it is, you’ll know what it is if you haven’t, why it was such a great purchase for her and she also let us know if it really works because I really wanted to know that. I’ve been eying that. She also shares three key thoughts that she has on money as it relates to college and your kids.You would definitely want to listen to that. Let me share with you a little bit about Kelly Christian. Kelly is a wife, mother, entrepreneur, a library addict, a cyber-traveler and a lover of good wine and dark chocolates. She has been running a successful brick and mortar bookkeeping and tax business for over 10 years and at the time of this recording she’s been working on an online product to facilitate a more mobile lifestyle to enable her travel addiction. In her newest project, she teams up with small business owners to create custom systems around their money so they can focus on what they do best. She is a bookkeeper by day, technology sleuth by night. She feels that your money should make your life easier and more joyful. So Kelly will definitely help you in this reality. 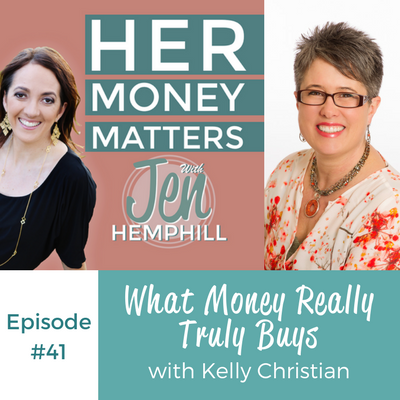 [0:03:33.5] JH: Welcome Kelly to the Her Money Matters podcast. I’m excited to have you here. [0:03:38.5] KC: It’s great to be here Jen, thanks for having me. [0:03:41.5] JH: Well I tell you, we’ve connected recently and I’ve been connecting recently to a quite a few bookkeepers. Obviously bookkeeping is a huge need and high demand but it’s just been interesting how I just been connecting with more and more bookkeepers recently. But enough about that. I wanted to — we already know about you, the professional, we know a little bit about your likes but I was wondering a little bit more about you. Maybe something that you could share that maybe you haven’t shared before or maybe you can talk about, you had mentioned you’re a library addict, you love to travel, wine, those type of things. Just share something that maybe you haven’t shared before. [0:04:36.1] KC: Oh yikes. Well, that’s most of it, I’ve got two teenage sons that are leaving home, one’s left, the next one is on his way so I’m on my way to being empty nester, that’s changing our family dynamics again, and again it affects our finances as well right? That’s a whole another stage of money issues and personal issues. That’s paving way for us to be able to travel more, hopefully. Fingers crossed. And in addition to my brick and mortar business which is becoming more virtual because I have more virtual clients, I actually made my first two sales on my online product last week so that was kind of a cool thing. [0:05:20.7] KC: It’s not a lot but it was a big step, it’s been nine months in the making, right? It was kind of a cool thing. [0:05:26.1] JH: That is a cool thing. [0:05:28.5] KC: That’s the most new and exciting in my world right now. [0:05:30.7] JH: Awesome. Tell me, how did you get into bookkeeping? Why bookkeeping? [0:05:37.7] KC: Bookkeeping honestly I went and did that — back in the university I was working at a pub waitressing as well and taking my pre commerce courses and the owner wanted me to come in and do some of the cash stuff for him. So I started out that way and I learned way back on a computerized system that was called DacEasy back then and it was basically like almost like doing code. It wasn’t any of the pretty stuff we’ve got now. I learned then and then learned within my commerce program as well, we did more of the financial stuff. That was where it first started and then I’ve been doing it sort of on and off and the kids were really little. Small pieces here and there for small businesses, nothing formal. Just to have something to do because I’m not real good at being that one that sits in front of the TV all day. We live in the country right? You got to find something to do because you can’t go to the mall. It’s just grown organically until then and then in the last two years, last year was a bigger year and then this year has grown exponentially just because I joined a masterminding program.The accountability and the focus on becoming the CEO of my business versus just letting things happen has changed everything. [0:06:53.4] JH: That is wonderful, that’s great to hear. [0:06:55.2] KC: It’s huge, yup. [0:06:56.1] JH: That’s great to hear. Now I’m going to change gears, I want to hear more or not more, I want to hear about how you grew up around money. Go back to your childhood or maybe your earliest memory, tell us about that? [0:07:12.1] KC: There’s a couple of cool stories in there but my mom and dad, my dad was a carpenter from Ireland, immigrated from Ireland he’s like 26, met my mom. My mom was an occupational and physiotherapist. She had the steady job all the time, the good steady job. My dad being in Calgary with the oil booms and busts, right? So he sometimes had work, sometimes he didn’t so it was sort of one of those kind of situations we grew up with. You know when you had one but we always made, my parents always made a lot of time for traveling, that was sort of where that comes from. They spent their money choosing to take us places because they both worked a lot right? So we had our family time that way and then yeah, overall, the money was — there was always money, it was never like we went without ever. There was a few times that I know my parents the one best story and epitomizes the way they did stuff is we went — I don’t know how old I was, seven or eight years old and we go into where the Calgary stampede is. So there’s these giant buildings and they do this spring home show and camping and boats and this whole big thing right? We go in there looking and we go, “Oh.” Well my parents decide to buy a motor home. [0:08:29.0] KC: At the show. I don’t think there was any planning involved, there hadn’t been any discussion. They just decide, “Yep, we’re buying this motor home.” And that was on a Saturday or Sunday and the following Monday my dad lost his job. [0:09:10.4] JH: How do you think those decisions, those situation, how they handle money or what they said about money, how has that — because you mentioned a point about the traveling that they made a point to travel. Their priority was traveling and that’s — you mentioned that that has impacted you because that’s one of your priorities. What else do you think from growing up and the example they said, the experiences that you had has now in adulthood and being married and with a child. How has that affected you or what do you see that you’re doing that stems from that? [0:09:56.1] KC: That’s interesting, I’ve just been in a part of another sort of money mindset group and been working through a lot of that stuff, which is quite interesting because you think, “Oh I don’t really have any money issues because my parents were fine.” And really it was fine and I’ve always had a problem with credit cards. I can’t not manage, I do it, I have great intentions and it always gets away from mea and it’s not even — I don’t know if it comes from them, from that sort of, I’m not sure what the psychological, it’s obviously coming form there because it’s been like that since I was 16. I got my first credit card when I was working at the bay. I don’t’ buy things, I don’t have nice clothes really. I don’t have a bunch of shoes, its’ just stuff goes on there and you overspend and you just don’t see it. I have learned that that’s — that comes from somewhere and I don’t know if it’s maybe some of that boom or bust kind of stuff that went on with my family growing up that sometimes they had lots and then my dad was off and it was like, “Ah, I’m not sure if I can relate it back to that.” That one I haven’t figured out yet. [0:11:04.1] JH: Interesting. Because sometimes, you're right, sometimes we don’t even realize it, I know for me, I didn’t notice anything how it affected me until I met my husband which his way of finance is completely different from mine. When I met him I was always saving and not really spending because I grew up in a household that there is a lack mentality. Therefore I worked hard for the money but I didn’t want to spend it because why? I was afraid to not have any because that was what was happening. Just sometimes it just depends. Sometimes it’s just a matter of you may not figure out right then and there but just sometimes you might have a thought or two and then you have the “aha” moment but that’s great that you’re in a group that you’re figuring those things out. So there’s all that messaging, I know I grew up with. That makes me as I’m just coming to grow up so that now going, “That’s why I haven’t until this year moved past a certain income level because I don’t feel, like as I was always been told, you don’t deserve it. Unless you’re working really hard, there’s no way you deserve that because it’s not fair because other people work really hard and they don’t have that,” right? That messaging has made a huge impact in my life and that’s been a huge aha moment this year. Doing the Ho’oponopono — I’m not going to say it wrong Ho'oponopono I believe it is, it’s a meditation to sort of help you figure out some of that stuff which is what I’ve learned and really powerful. [0:13:03.6] KC: Yeah, you ask four questions, I’m going to forget here. You go back to a situation that’s troubling for you and you need to say, “I forgive you. I’m sorry. Thank you and,” — oh there’s one more. Anyway, there’s this four sayings and you have to take. In every situation you have to thank them for whatever you’ve learned form that, for good for bad, you’ve learned something from that situation. You have to say “I’m sorry” because no matter what happens, you have some part in it. Whether you’re a victim or not, there’s still some part that you have played in that scenario that maybe you could be sorry for them for having things have happened to them to make them that person that would do that. Then the forgiveness is universally such a hugely powerful thing as far as changing your wiring. Oh it’s going to kill me, the fourth option but it’s been amazing. [0:14:02.7] JH: No worries. And I haven’t heard of this one in particular. I’m always, I incorporate the mindset but I’m no expert by any means. So it’s always interesting to hear the difference, exercises and different things out there. I haven’t heard this. I’ve heard similar from the I forgive especially the gratitude. The gratitude is always in there. Thanks for sharing, I’ll look it up or if you can share that with me later I’ll be sure to include it on the show notes so that way for those that are interested they can definitely take a look into that. [0:14:45.2] JH: Love it. I love simple. [0:14:45.6] KC: I do too. I don’t have time for anything else. [0:14:50.6] JH: Absolutely not. That’s great, thanks for sharing that. How about the best advice that you’ve received around money? What would you say that is? [0:14:59.1] KC: The best advice honestly has been across the board. My husband has been a really good — he is more like you, he didn’t come up with a family of lack for the savings but he is just naturally a saver. He’s naturally that guy that just, the money just — he doesn’t need to spend it and when he does, I don’t know if it’s advice, it’s just influence perhaps is the best word to say. [0:15:41.5] KC: He’s totally that guy. It’s a really great dichotomy back and forth between the two of us. [0:15:45.6] JH: It’s interesting how in a relationship or in a marriage that that’s who you’re paired up with because I know with my husband. Most of them, and I can’t — all the interviews that I’ve had, it’s pretty much, they’re the opposite and one’s the saver, one’s the spender. Just interesting how that just happens. [0:16:06.7] KC: Yeah, for sure. [0:16:08.8] JH: ‘Cause I know for me I’m the saver, my husband’s more of the spender, we balance each other out very well. What would you say are your challenges that you have with money? [0:16:19.6] KC: Oh challenges, our ongoing challenges in ours has been the communication. I tend to — I was a stay at home mom for a lot. I did a little bit of stuff in the side but mostly stay at home mom for the first 10 years, eight years of my kid’s life. There was a lot of time in there that he worked really hard and I manage the money because I just always have. He would say, “Oh well, you want to buy this tool or I want to go and do this.” Instead of saying, “Oh we can afford that.” I would just juggle it and make it work instead of — right? Just juggle it and that’s where the credit cards we get up and then all of a sudden a year would go by and it got up and up and then we have the discussion finally about where it sits and he flips because it’s gotten not into a scary ugly but ugly enough that he had no idea of. Then he doesn’t ask and I wasn’t telling. Because I don’t want to stress him out, I didn’t want him to worry about it because he was taking care of that other side, so I want to be able to handle this. The big one there was with, I listen to Dave Ramsey. It’s kind of like going to AA for people that use credit cards. [0:17:29.5] JH: You are funny, that’s a good comparison. [0:17:32.2] KC: It totally is, you listen to it every day and you can just listen to him and tell him people — and there’s people out there with stories that are just, they blow your mind about, and a lot of it is really just stupid not just mindset or not being aware or habits, some of it is just plain stupid right? That was a really good starting point of sitting down every month and we talk about what’s going to happen with our money. That has changed everything because it’s just the talking. It doesn’t turn into that big thing at the end where it’s this big blowup and the world is ending because it’s there and you never told me and yeah. [0:18:12.3] JH: Good, I’m glad that has bettered for sure. So you’re the money manager and tell me a little bit if you just, in general terms, with whatever you’re comfortable. How you manage your money in your home? [0:18:27.6] KC: Sure, we’ve got one credit card that we use, and Trevor has it, I don’t have the credit card, we’ve made that decision. [0:18:40.7] KC: It is what it is. It was one of those, yeah absolutely, you have it and then I don’t. I have access if I need to buy something online I’ve got the numbers so it’s not like I don’t have a card to use but it’s just safer that way. Then, I use You Need a Budget — YNAB. I use that religiously so that’s what we use each month to sit down and talk about what the money’s going to look like. What we’re going to spend on and then I keep it up to date, probably I do it, it depends. If cash flow is tight, I’ll do it every second day and I’ll go in and make sure and then upload the bank stuff in there so I know where the money’s sitting. If cash flow is better then I don’t worry about it. It’s probably once a week. It’s no less than once a week that I get on that and we… I’m in there knowing exactly where all those numbers sit just because I find if I don’t, things just go sideways if I don’t pay attention. [0:19:34.8] JH: Right. So you use the software — you were going to go. Sorry I interrupted you. [0:19:41.0] KC: Nope, I just use the YNAB software and I use that and then I’ve got everything else is electronic online banking through our local credit union and that’s really, it’s not a lot. I’ve got as much of I can automated for paying this. I have everything that comes out on the beginning of the month because I found prior we had all these auto payments and they are all over the place. Several years ago, we were both self-employed. My husband is always been self-employed all the way up until about three years ago when he had actually had a real job. You never knew A, when a client was going to pay and then you got all this bills come in at different times. The one big thing that I did and it helps, it’s perfect even now is I went to every single bill person. [0:20:42.3] JH: That is a great tip. [0:20:45.9] KC: Even your credit card’s almost everybody will change that for you if you ask. They might be a bit of a double up period there while they get it sorted out but it’s that changed, the stress level was huge. [0:20:56.3] JH: That is a great tip that is a good one. Tell me because I know you mentioned you have two kids and one’s going to go to college right? Tell me about because you mentioned also some of the challenges in finances are you just going to — there’s going to be some challenges on finances. How are you planning or what are you thinking in terms of to handle, ‘cause I’m assuming you’re as far as college expenses and those type of things? So tell us a little bit about that if you want to. [0:21:29.1] KC: We actually had our oldest son went to college last year. Then the other one’s graduating this year. We did it last year and we had, here in Canada we got a savings plan that’s called the registered education savings plan. You can put it in and I was trying to think what’s equivalent to but I think you guys have the similar program in the states where you put money in for education right? My husband’s family, his parents have been putting into it each year and we’ve put some in but just where we were at, it wasn’t a priority earlier to put the money in for that. This year, it was that year it was good, we cash flowed the other half of his, which was a bit of a struggle but we did it because he had about half of it paid for with some scholarships and some of the money from this RESP. Then we cash flowed, I think $10 grand last year for school right? Just because we didn’t have the opportunity to put it away. For us the priority was making sure that our house was in order, that our debts were being paid down before we were putting money away for school. It just didn’t make any sense to us personally to do that. In all honesty my kids will be paying for their school, I will help them to the point that they don’t need to take student loans because I certainly don’t want them to be in that situation because it’s just astounding how much debt is out there from student debt, right? It’s just crazy right now. [0:22:58.0] JH: Yes it is. [0:22:59.7] KC: We’ll help them but I managed to pay my way through university, I took one less course, a semester, worked, nights, evenings, weekends and I paid for it and I came out of my schooling with no debt. I’m expecting my children to pay the same. You can work, people that say you can’t work while you go to school, unless you’re like taking premed or something. Other than that, take and extra year but you can come out without any debt, right? [0:23:25.3] JH: Absolutely, you’ve already set the example for them that you did it. So they can too. [0:23:29.9] KC: Well you can and I think to expect that of them is a good thing because they’re investing in their education and if they have to pay for it. [0:23:37.2] JH: It makes a difference. [0:23:38.4] KC: Yeah, so what we were hoping to do is to give them, at the end of the run, if they go through and finish a program as a gift, give them some of the money maybe that we’ve saved as a gift to pay stuff off or to help move them forward at that point but not give it up front. [0:23:54.7] JH: Right, that’s smart. I know for us, we’ve been saving, we’ve got two boys but they don’t know about it. So our plan is, now I’ve mentioned in several episodes, “They cannot listen to this podcast.” The plan is save, it’s just been here and there saving consistently, but once it’s time for them to go to college, they need to work for their scholarships and figure out how they can pay. And then from there, once they do all the work to do that then we can say here you go. Just like you were saying. Because I definitely, it becomes — it’s more of a value for them. [0:24:40.5] KC: Yup. I think a lot of people get really hung up and really feeling that they owe that to their children and I don’t agree. There’s so many people that will do it at the expense of their own retirement or at the expense of their own financial situation and honestly I don’t — it’s unfortunate that school is so expensive and it’s such a tough spot. [0:25:26.6] KC: If you’re going to be a lawyer or be in politics, yes maybe that makes a difference right? Other than that, it doesn’t matter, you’ve got that piece of paper, it’s all they want to see. You don’t need to go to that expensive school, you don’t need. [0:25:37.5] KC: A lot of people get really caught up in all of that and it’s unfortunate. [0:25:42.2] JH: Right. Because I agree, ‘cause if there is a certain degree and you can get that same degree elsewhere for less money. [0:25:51.0] KC: Yup. Cause as an employer they’re not looking yeah. [0:25:53.9] JH: They’re not going to pay you any extra just because unless I mean, granted there’s some places because of who you know there might be some advantage that way. In general. [0:26:05.9] KC: Yeah, I agree. [0:26:08.3] JH: Definitely. Now what would you say is your best money spent? [0:26:14.8] KC: Oh honestly, and it’s going to sound completely ridiculous but I’ve got my robotic vacuum. [0:26:21.3] JH: Hey, which one is it? [0:26:24.9] KC: It’s a Roomba. [0:26:27.1] KC: Oh my god, I love that thing. Every day it goes, and you’re like, “Oh, I don’t have to vacuum today.” It was a business write off because. House cleaning expenses. [0:26:41.1] KC: That and then we took the kids to the Bahamas two years ago and honestly it was a real stretch, ‘cause we knew we had to pay for our son for school that coming fall as well and we went in February of the same year and it was honestly the best money we’ve ever spent. It was a stretch, but it was the last time we would be able to go somewhere as a family I figured, and it’s come true to that. It might still come later but the dynamic will be so different. We had two weeks, just the four of us, there wasn’t a lot of people around, the boys were lobster spear fishing, it was the perfect — it was a stretch but well worth every penny to have that last kick at the can with them. For some reason, he said it different this time. Mom I’ll be — because we move around a lot so he’ll say, “By the time we move this time I’ll have been to college or in seven years.” However he said, I don’t know what it was about that day that he said it. It hit me hard because I thought of, “Have I been the best mom, have we done the things together that we’ve been wanting to do? And the travels, the trips that we wanted to take them on?” Those type of things, it just kind of hit me hard that day because you think about those things. Like you said, it might be the last — who knows the next time, he might not be available because something is going on in college. But yes, that one hit me, that hit hard and hit home. [0:28:38.7] KC: That’s what money should facilitate, that’s getting your head around the money thing is not about buying. For us at least, it’s not for buying stuff. It’s to buy us time to be with those people and in those situations that we want to be in and that’s what the money is. That for me has been a journey this year. Getting to that point as well. Instead of just grasping for, to pay this, to get the bigger vision of what the really important thing on what are we really working for here. It changes everything once you can get that big picture piece. [0:29:22.2] KC: I was such a freaking skeptic, I was so skeptical about my husband trying to get me one three years before that and when he saw it, he was at a lady’s house doing some renovations. But she lives by herself, she has one of those houses that you walk in and it’s pristine right? I live in a house in the country, now we only have three cats, we have three cats, a dog, I’ve got two boys and a husband. There’s dirt, there’s dust. We live in the country, right? It’s not an easy house to keep. [0:29:53.3] KC: Oh yeah. And we’ve got wood floors and we’ve got tile and we’ve got carpets, we got all this different surfaces, he tried to get this for me and I’m like, “There’s no way that’s going to work in my house, you kidding me? That’s ridiculous.” Then I bought one about three years later and it’s amazing. It goes up over a little lip over our mantle in front of our fire place, it pops up over that. I have to clean mine every day because we have so many pets right? You can set it on to go off by itself every day at a certain time. It goes under the couches, it’s amazing. [0:30:26.9] JH: Do your dogs a want to play with it? [0:30:29.3] KC: No, they all hate it, they just stay out of the way. You could see those videos of the cat and the cape just, you know, riding on it. I don’t know, it doesn’t happen in my house. [0:30:49.8] KC: It’s great, seriously. It’s the most amazing thing. [0:30:53.8] JH: That’s good to know. How about your favorite money book, what would you say? [0:31:01.5] KC: There’s a bunch of them, there’s the wealthy barber which is really good, I’ve actually just — I think it’s a Canadian one, I’m trying to remember the guy’s name. My mother in law gave it to us years ago and then — but he is basically of the theory of pay yourself first. No matter what happens, pay yourself first which is a good one to have but I’ve been reading Tony Robbin’s new one and I’ve got it in my bed side table. [0:31:24.9] JH: It’s a big — I read it. It’s a big book, it’s a lot to take in but it’s a good one, I read it. [0:31:30.1] KC: I really liked it because I’m big in the industrial side, I’m really interested in that and working with my clients, trying to be able to explain stuff to them in non-accountanese. [0:31:43.5] KC: Right? ‘Cause they do, accountants talk like that and people just sit there and they don’t want to look stupid so they’ll just sit there and go, they come to me and they go, “I have no idea what the accountant said.” Why didn’t you ask? They don’t want to look dumb right? Tony was really good, I liked the way he sort of was explaining it in the book which was kind of cool that if — his thought is that maybe it might be something that people that don’t talk in that kind of language can read and understand right? Some really great theories. [0:32:18.6] JH: Yes, I go back to it quite frequently just kind of to refer. ‘Cause it’s a lot, it’s a lot of information, it’s not one book that you can sit and read and I guess you could read on weekend, but I wouldn’t recommend it because it would be information overwhelm. Its’ a book that I did take a little bit. I think I probably took a month to read just to simmer the information and just let it sink in. Awesome, I like those suggestions. I’ll put those in the show notes as well, I’ll have to look up the wealthy barber. [0:32:49.5] KC: Anything Dave Ramsey as well. [0:32:53.0] JH: Absolutely, I agree. Well this has been great Kelly, as you know, this podcast is all about making money simple and taking control of it. How would you finish this sentence? Her money matters because _____. [0:33:12.2] KC: Because it gives you time to be with the people you love. [0:33:14.9] JH: Love it. Perfect. I really appreciate you being here, I appreciate the stories that you shared, your insights and tell us where is the best place for people to find you and learn more about you? [0:33:29.9] KC: Well you can come to my website at www.kellychristianandcompany.com or I’m on Facebook a lot. That’s sort of my hang out marketing people connecting place. I’m not big on any of the Twitter or any of that, I do it but I’m not good. Facebook or my website. Either/or. That’s where I hang out. [0:33:53.2] JH: Perfect, I’ll be sure to put that in the show notes as well and again this has been so much fun. I really enjoyed and the terms I learned — accountanese, those type of things. I enjoyed talking to you. I hope that we connect again soon. [0:34:12] JH: Wasn’t Kelly such a fun person to listen to? I had so much fun of just chatting with her. If it wasn’t obvious with how often I laughed. One thing that I have to tell you that really stood out for me from our chat with Kelly is the investment that she made in a mastermind that she participated for her business. Now, if you aren’t a business owner, I’ll tell you briefly what it is if you're not familiar what a mastermind is. Basically, masterminds can either run paid or non-paid. Where it’s just basically a gathering of your peers that you gather to talk through challenges, you gather to keep each other accountable, for support and it’s just a really helpful way. Now, I’ll tell you in a moment why I bring this up and what it has to do with your personal finances. First I wanted to give a shout out to Cathy. She’s not only a part of Her Money Matters free community but also a member of our Fearless Money Sisterhood, she’s motivated, she’s very hard working on her money goals and she is such a great cheerleader for everyone, including myself. If you are around Cathy, even just in the Facebook group. You’ll instantly light up just how she is. That’s the energy that gives out. So Cathy, I really can’t wait to see the shift that you and your husband make with your personal finances because I know its coming. Why do I bring up the mastermind that Kelly invested in for her business? Here’s the thing. You need to surround yourself with likeminded people. Kelly was surrounded with likeminded people in her business sword. The same can happen to you with your personal finances because you're worth it, you deserve this. With our Fearless Money Sisterhood program you can just take it for a drive, for one dollar for a whole month. It’s $25 after that every month. [0:37:22] JH: And she means the chief wealth officer. 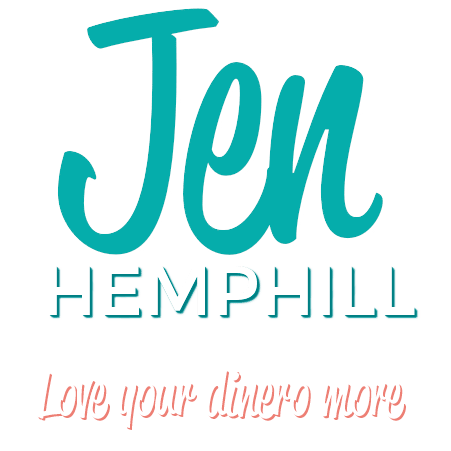 I wanted just to take a moment to invite you, to try it out, you can do that at Jenhemphill.com/podcastdollartrial. I will include this also and a link to this in the show notes as well, that way if you are driving and you can’t get on the website, that’s completely fine. That is a wrap for today, I want to thank Kelly for joining us, for just being so much fun and making us laugh, sharing such great insight and sharing such great stories. You can check out the show notes on where to find Kelly at Jenhemphill.com/41. That is Jenhemphill.com/41. Thanks again for tuning in and we’ll catch you again next Thursday.